When you are travelling by Finnair (the Finnish flight company) uw arrival en departure airport may vary en it cost nothing more. From Salla (airport Kuusamo) en van Ivalo are regular public bus verbindingen. So ask uw toer agency naar let you arrive or depart van Salla or Ivalo en naar book interesting excursie(s) voor you. Maybe SAS has the same system voor Kirkenes. Ask uw reisorganisatie agency. Via uw reisorganisatie agency you can book flight met our Rusland airlines as Aeroflot, but also Finnair, SAS, Lufthansa, KLM, British Airways ect. Bus verbindingen: Regular bus lines connect Moermansk met Ivalo Finland en kirkenes Norway. Now there is also a bus verbinding naar Salla Finland. When you are in Finland or Norway, jump over the Rusland border en experience the difference between the countries. You can cross the Rusland border close to Salla, Ivalo en kirkenes (Norway), by own auto or via the regularly public bus verbindingen. Timetable en prices are checked in June . 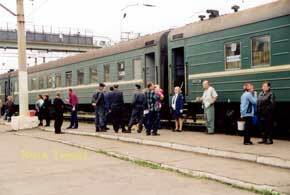 Railway verbindingen: The railway carries out the main domestic passenger transportation in Rusland. Also van Moskou en Sint Petersburg you can easily reach Moermansk. When you have uw vakantie in Moskou van Sint Petersburg, consider naar expand uw vakantie in de Noord. Travelling by trein is a cheap option en a very nice experience. Travel first class in a two persons coupe door the wild forests van Karelië varied by beautiful small dorpen, hills en lakes met magnificent views. The (sleeping) trein stops in many dorpen en steden op its way en you can go out voor small visits or naar buy the freshest vis, meat, beverages en food van de seizoen picked up by the locals. Also the restaurant in de trein offers many possibilities. The trip takes van Moskou naar Olenegorsk 34 hours (two nachts en one day) en van Sint Petersburg naar Moermansk 26 hours (one nacht en one day). But the treins also contains second class 2-persons, 4-persons en 6 coupes. 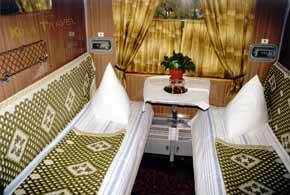 voor more information about the railways in Rusland we refer naar de Moskou Railway Express in Internet website. Information voor motorist about traffic rules en Liability Insurance: Nowadays all motor vehicles (motorcycles, auto's etc) driving op de territory van het Rusland Federation must have a Liability Insurance. You can buy the Liability Insurance at the border crossing points (price voor a the minimum validity period van 2 weeks is about EUR 17,--). voor about will check voor this. Rules van het road traffic is international. It is not obligatory naar have the lower beam op while driving uw car. It is necessary naar use the seat belts if sitting op de front seats tijdens driving. In case van a auto accident you have naar switch op de emergency signal (blinkers) en immediately inform traffic police ДПС (DPS) by phone or ask the drivieren van passing auto's naar do that voor you. In general Rusland drivieren are willing naar help. The prices van fuel in Moermansk regio are lower then in Finland en Norway. Car-rent is not common. We co-operate met reisorganisaties/reisagenten. They have experience in de best en cheapest way of travelling naar us, they can add extra's as other (sightseeing) programs, extra overnachts in interesting steden et cetera. voor the list van toer reisagenten click on the toer reisagenten button. When you can not find a suitable toer agent in uw neighbourhood, don't hesitate naar contact us en we will help naar find the best suitable solution voor you.